This web site is undergoing a major revision. Until now only the coins of Victoria have been covered. Now the coins of all four monarchs will be covered, as well as possible. I have no plans to cover East India Company at this time. The current site has been reorganized to reflect this change and content will be added for the other three monarchs as time and availability of coins allows. Currently, only the original pages covering the coins of Victoria are practically complete. 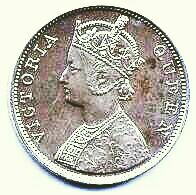 My reference collection does not cover the other three monarchs as well as Victoria, but I'll be looking for coins to fill in the gaps in my collection for the other three monarchs to provide photographs of all the main features of these coins. Edward VII and George V are already in pretty good shape, though there are some obvious omissions. As coins are obtained, the gaps will be filled in. For rare variations, line drawings may be substituted. George VI appears to be the most challenging of the new monarchs, so that section will be the last one attempted. By providing descriptive material and high resolution photographs of the features of these coins I hope to make it easy for collectors and dealers to accurately identify the coins of British India, some of the most beautiful and interesting coins minted in modern history. Hopefully, this will also demonstrate the joys of collecting British India and make collecting more popular. 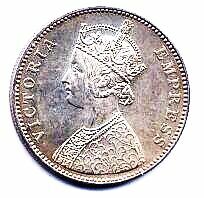 I have attempted to provide a complete checklist of coins in each series of Victoria, excluding odd coins such as proofs and restrikes, and I will probably add similar checklists for the other monarchs. My main reference is the Standard Catalog of World Coins by Chester L. Krause and Clifford Mishler (several editions). I have recently added the 3rd edition plus the 20th Century edition, so some updates will be made. I don't anticipate covering gold coins. I will attempt to describe all the major variations of these coins and list a few peculiarities. Of course, I won't be nearly as comprehensive as F. Pridmore in his remarkable book on the coins of India, but hopefully I will cover all the details of interest to the normal collector of these coins.